Bitcoin’s lack of correlation to the stock market is probably one of its main selling points, but what about altcoins with negative correlation to Bitcoin? It’s generally agreed there’s a weak-to-negative correlation between Bitcoin and the stock market. And that’s a good thing. Savvy investors who want to diversify their portfolio understand that when one asset falls, another tends to rise. This helps them diversify risk. So, what about investors who want to diversify their cryptocurrency portfolio with altcoins with negative correlation to Bitcoin to hedge their bets against its swings? A cursory glance at the markets often leads people to believe that Bitcoin and altcoins are heavily correlated. In most cases, that’s often right. If Bitcoin’s in the green, more often than not Ethereum, Litecoin, Cardano, and EOS are on the up as well. There are always exceptions, but generally, the correlation between Bitcoin and altcoin price is steady. However, not all cryptocurrencies follow the same patterns as Bitcoin. This is important for cryptocurrency investors to know. If there are certain top altcoins with negative correlation to Bitcoin, that gives them a chance to gain maximum benefit from their crypto assets. They can effectively hedge their investments so that when Bitcoin drops, their negative correlation altcoins don’t follow suit – and vice versa. DataLight recently carried out research on the top 100 coins to find out which ones displayed the least correlation to Bitcoin over time. 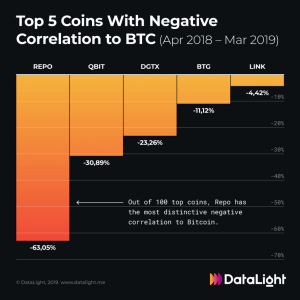 Their findings revealed the top five altcoins with negative correlation to Bitcoin from April 2018 to March 2019, and why that might be the case. As the top altcoin with negative correlation to Bitcoin, REPO probably takes the cake. When DataLight’s research came out at the end of last month, REPO had been garnering media attention. Its price soared in the first quarter of 2019 to generate a whopping 63% negative correlation to BTC. Since then, however, as BTC has risen, REPO seems to be dropping off of a cliff. It’s dropped out of the top 1,000 coins and its trading price has fallen from its high of over 7 cents to just over 3 cents today. Since its launch in 2018, Qubitica (QBIT) has shot up by over 550%. Moreover, February 2019 saw its price go up in a straight line, which probably explains its 30% negative correlation to BTC price. Ranked 78th today on CoinMarketCap, QBIT isn’t following the same trend this month. After a brief drop on 1st April, its price is actually going up with BTC right now. This serves as a reminder of a couple of salient points, mainly that the cryptocurrency market is so new and fluctuations and changes may be based on the stage of a project and surrounding media, announcements, and development – rather than a consistent negative correlation. Investors in crypto need to follow their portfolios daily since changes come quickly in this area. Digitex Futures is a few weeks away from launching its commission-free futures exchange. Exchange tokens, on the whole, have proven to be a good source of ROI, fairing well even in a bear market. Binance Coin, KuCoin Shares, and Huobi Token, like DGTX, are all altcoins with negative correlation to Bitcoin generally. Why should this be? Exchange tokens, unlike other utility tokens or security tokens, have clear use cases. In the case of DGTX, it’s the only means by which traders can access the exchange. This means that even in a bear market when the price of BTC is descending, as long as people are trading, DGTX will show no correlation. In fact, today, as BTC and most major altcoins are trending to the red, Digitex is up almost 4% at the time of writing. Bitcoin Gold also makes the list, but not because it has outperformed Bitcoin. In fact, its negative correlation comes from the fact that it has performed substantially worse than BTC each time Bitcoin’s price has improved. Controversial from the start, the Bitcoin fork was largely unpopular due to the fact that the pre-mining party held back 1% of its supply. Moreover, BTG has suffered 51% attacks that have served to tarnish its reputation. At -4.42%, LINK has the least negative correlation with BTC. However, it has still acted consistently differently from BTC from April 2018 to March 2019. With a solid use case to connect smart contracts with real-world data, LINK hasn’t really noticed the rest of the crypto winter, performing well even against the general market trend and falling BTC price. In volatile markets like cryptocurrency, nothing is set in stone. This analysis was based on a year’s worth of data. However, the cryptocurrency market had a swing to the upside just days after the report’s release. It’s always a good idea to diversify your cryptocurrency portfolio. And if you want to reduce risk and hedge your investments, selecting altcoins with negative correlation to Bitcoin overall is a sensible idea. The ones with the strongest use case even in a bear market, such as exchange tokens, appear to make an excellent choice.